Rex Ryan stays in the AFC East and moves on from coaching the Jets to the Buffalo Bills. Rex Ryan asked the front office to make a bold move and acquire LeSean McCoy from the Eagles. The race-baiting running back saw a drop-off in production this past season, as his offensive line dealt with injuries. Not having DeSean Jackson around to take attention away from the defense also hurt. McCoy consequently saw his yardage plummet from 1,607 to 1,319 even though he had the same amount of carries. While We Were Away: The Bills acquired Matt Cassel for a swap of mid-round selections this off-season. While he formerly had some success in New England and Kansas City, Cassel is nothing more than a reliable backup. He struggled in brief action for the Vikings this past season before breaking his foot and losing his job to Teddy Bridgewater. LeSean McCoy will definitely have the luxury of his foes being focused on Sammy Watkins, but will he have adequate blocking? It doesn’t seem so. The only proven, talented offensive lineman on the roster is left tackle Cordy Glenn, who had a solid 2014 campaign in all regards. Center Eric Wood is also decent, while the newly signed Richie Incognito, who is expected to play right guard, is a question mark; he used to be a skilled lineman, but he’s a 32-year-old who missed an entire season of football. There could be rust. 2015 Season Outlook: Sammy Watkins was Buffalo’s sole play-maker last year, but that’s no longer the case. The Bills added two players who could provide a spark: Percy Harvin and Charles Clay. Harvin can go the distance every time he touches the ball, but he has proven to be a major headache in the locker room. It’s no coincidence that the Vikings, Seahawks and Jets were all thrilled to get rid of him. The more-promising addition is Clay, who will provide Buffalo with the upgrade at tight end it has needed for years. 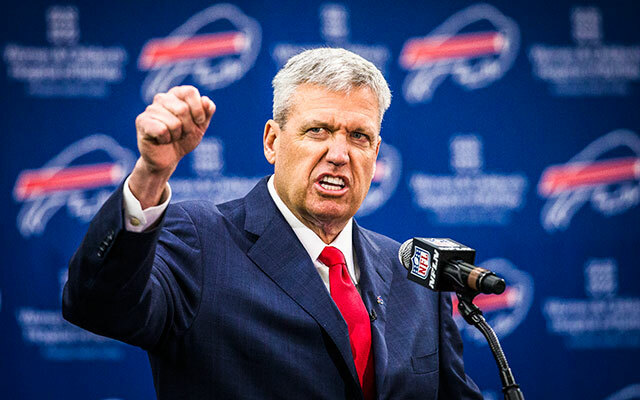 The Bills allowed just 18.1 points per game last year, a figure that should improve in 2015 because of Rex Ryan. The new head coach will move the team back to a 3-4 scheme, so the duo of Mario Williams and Jerry Hughes will be stationed at outside linebacker rather than defensive end. This won’t affect either negatively. In fact, Hughes is a better fit in the 3-4, so the tandem could combine for more sacks than they racked up in 2014 (24.5). The only concern at the position is that the Bills don’t have any sort of depth behind Williams and Hughes, so they could be in trouble if either goes down. Buffalo will also once again be strong on the defensive line. The unit will be comprised of Marcell Dareus, Kyle Williams and some sort of rotation between Jarius Wynn, Stefan Charles and Corbin Bryant. Dareus thrived at nose tackle when he played the position in 2013, so it would make sense for him to succeed in the same role this upcoming season. Dareus will be suspended for Week 1 because he violated the league’s substance-abuse policy, but he’ll only be out that one game. Williams, meanwhile, is a terrific player in all regards. He’s such a great pass-rusher for a player at his position; he tallied 10.5 sacks from the five-technique spot back in 2013. However, much like the outside linebacker position, depth here is severely lacking. With the front seven generating so much pressure, it’s no surprise that the secondary played so well last season. The top performer in the defensive backfield this past year was cornerback Corey Graham. However, Ryan said that Graham will be moving to safety in order to get the top athletes onto the field at the same time. Graham will be taking the spot of Da’Norris Searcy, who signed with the Titans this off-season. Graham will lineup across from Aaron Williams, who was solid last year until a nagging neck injury derailed the second half of his season. Ladies and gentlemen let us not forget last season the Bills went 9-7 and were in playoff contention. With Rex Ryan and the new weapons on offense and that great defense that will only thrive under Ryan’s leadership this team could be an under the radar performer this season. Ryan has done this before with his last team the Jets, limited at QB but could run the football and stop people on dense and that formula can help you get deep into the playoffs. In a year of no clear dominant AFC team don’t be surprised if the Bills stop their playoff drought which they last played in 1999.